Often overlooked in a child’s arsenal of protection from the sun junior sunglasses are as important, stylish and accessible as the adult models. Haute fashion labels including Ray-Ban, Gucci, Dior and Police have each created junior collections mirroring the designs of their best loved and most iconic adults’ sunglasses. And Cebe, Rocket and Baby Banz were created with young eyes specifically in mind. Children’s imaginations will be captured with these colourful and creative designs. 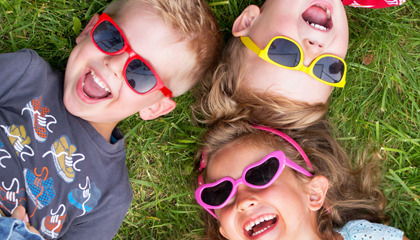 All childrens sunglasses are UV400 protective.